The socialization program for team cohesiveness was carried out at the Tourism Awareness Group (Pokdarwis) of Mojo Village. This Pokdarwis has just been formed and has a role in managing boat tours and star fruit plantation tourism owned by Mojo Village. Boat tours and star fruit gardens are the mainstay of Mojo Village. 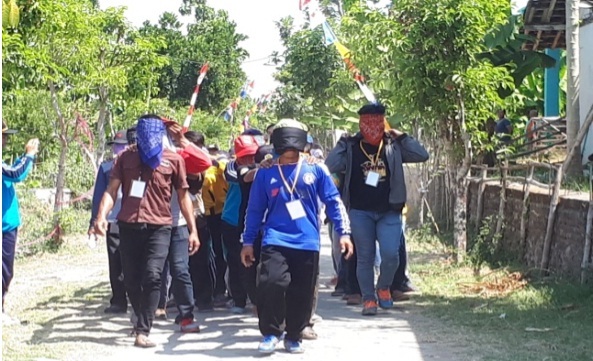 The socialization for team cohesiveness was carried out with 33 people targeting the entire Pokdarwis group. Outbound activities are carried out indoors and outdoors for one full day. The purpose of outbound activities is to build the work of the Pokdarwis team as a whole and foster motivation among Pokdarwis members. The success of the socialization program was seen from the enthusiasm of Pokdarwis during outbound and through filling out questionnaires from members of Pokdarwis. Pokdarwis members have internal motivation that is better than external motivation. Internal motivation leads to self-motivation of Pokdarwis members, while external motivation refers to factors outside oneself. The results of data processing indicate that Pokdarwis Mojo also has good team cohesiveness. Compact teamwork and strong self motivation are very much needed by Pokdarwis in developing tourism in Mojo Village.